A very, very, easy to implement "Fish"
Right now, we have a fish item, but no fish mobs in Minecraft. A fish mob would be difficult to code to make it work with fishing rods. My idea is to do away with the idea of mobs, but instead have fish "particles" that only generate in water in Ocean and River biomes. The particles would be fairly large, and they would be different colors. We could also have coral blocks that would look similar to a Dead Bush. There would be increased fish particles around these. As a particle sounds fairly decent, but can you explain more about them? A large group of water in Minecraft is massive, especially in Oceans, so can you explain how many of these fish particles would appear in large bodies of waters or how many particles per Block? Explain more about how much of this Fish Particle will be in some certain area.. I'm not a fan of this idea. Particles have always been offshoots from entities or blocks, and always short lived. I think by introducing "fish" particles, too many players will think them to be new mobs, and be confused when they can't interact with them. Having them float around coral blocks sound very interesting, and could make for interesting decorations in fishtanks if people move the coral. Endergirl, I see that people seem to not like your new profile pic, don't listen! Use the pic you wanna use! Aren't there already particles when you're fishing? I don't really see why you would need it when you're not fishing. This is actually a very good point. This idea is excellent on paper, but would add complications in the long run. Players might question why one of the particles aren't visually creeping on the fishing line. If any fish particles do go toward the line, it not only makes fishing too easy, but it visually conflicts with the chance of getting trash items (like tripwire). I don't support the idea, but that might chance if we get more info. The question is: What difference does it make and why? Fishing with your hands can be almost identical to regular Fishing, except without a Fishing Rod. So why add redundant alternatives when we can just stick with one and leave the other? I agree with you. I for one get very confused sometimes about which particles are for when a fish is coming to the line and when it's just having the particles "jumping" in the water. What about a fish "shadow," like in Animal Crossing? A new player probably wouldn't confuse them as a mob, because they would be 2D unlike mobs like Zombies or Creepers. They would also be very small compared to most mobs. 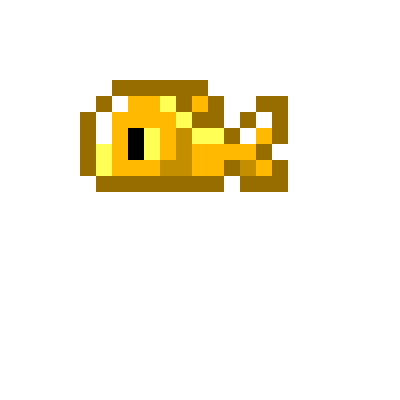 They would look kind of like a pixel art fish, like this. EDIT: Oh wow, these pics are huge. There would be 0-1 fish per block, but they would only generate within a 16 block radius around the player. Coral blocks would have 2-3 fish around them and in water touching them. One issue with this is: Would there be any animation? I doubt that they would make it 2D because there's nothing else in the game (Besides maybe paintings) that are 2D. They would need to be 3D to even add a new look to fish, and that fish doesn't look anything like the existing ones. 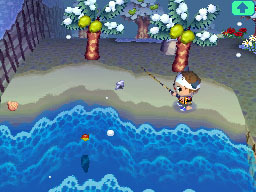 I know that it doesn't look like any of the fish in the game, as that was the only pixel fish I found on google images. I'll try to make a pic on MS paint later. I thought that particles were 2D, or are they like grass and have 2 2D cross sections? They act like text boxes that float above player heads. They are 2D, but always face the viewer. I don't think that the fish would want to have cross sections, because then it would look like two fish have merged at the middle and are some kind of fish mutant thing. They only do that if you have fast graphics on, in fancy graphic they are slightly more 3D and don't always face the player. Of course I'm probably wrong and sound like an idiot.